K-humate® is pure, highly concentrated humic acid which is produced locally using the highest quality raw materials. Only the best Australian brown coal is used to manufacture K-humate. The product’s high analysis and proven performance is now well recognised all over the world as the International Standard for Humic Acid products. Suitable for use with all forms of irrigation systems. For best results, use in conjunction with organic or mineral fertilizers. Apply 10-20 litres of K-humate 26% per hectare. When mixing with other liquid fertilizers, test for compatibility with a small quantity in a jar. Do not mix with low pH products. 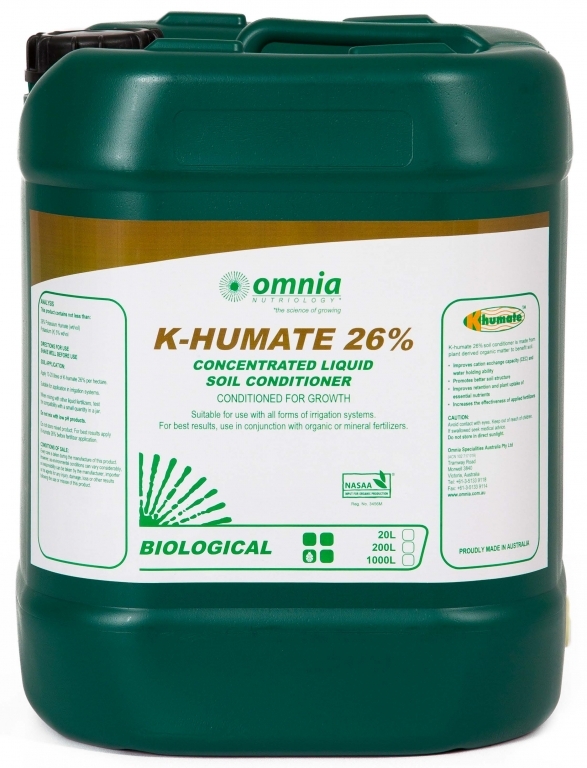 K-Humate 26% is a NASAA-Certified organic product of choice.